To take advantage of SharePoint’s collaboration features, Microsoft recommends SharePoint Online in Office 365. If that is not the best option for you right now, you should use SharePoint Server 2016. However, building a SharePoint Server 2016 farm in Microsoft Azure infrastructure services requires additional planning considerations and deployment steps. For a defined path from evaluation to successful deployment, see SharePoint Server 2016 in Microsoft Azure. This new content set reduces the time it takes for you to design and deploy dev/test, staging, production, or disaster recovery SharePoint Server 2016 farms in Azure. 1. A single-server farm running in Azure for demonstration, evaluation, or application testing. 2. An intranet farm running in Azure to experiment with client access and administration in a simulated Azure IaaS hybrid configuration. When you are ready to begin planning the Azure environment for your SharePoint Server 2016 farm, see Designing a SharePoint Server 2016 farm in Azure. 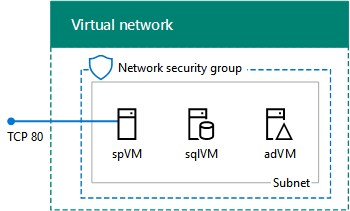 A table-based, step-by-step approach assures that you are collecting the right set of interrelated settings for the networking, storage, and compute elements of Azure infrastructure services. A table-based, phased approach assures that you are creating the Azure infrastructure with the correct settings, which you can adapt or expand for your business needs.